At long last, I am back with another super easy recipe for you. This one has been a long time coming. It’s based off a ‘healthy’ pasta dish that my mum and I tried at a restaurant a few months back. Since then, we’ve been trying to work out our own version of it and finally have a recipe that tastes lush. 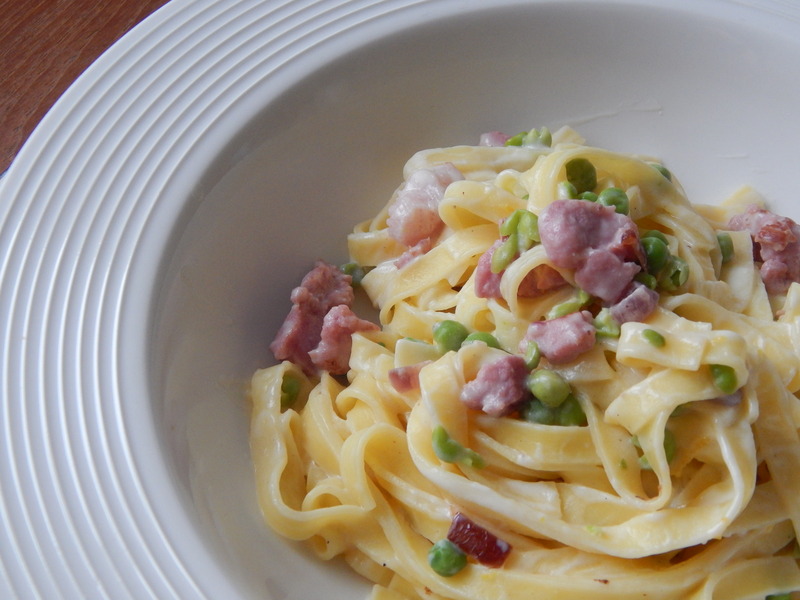 It’s probably very, very different from the one that you can find in the restaurant we visited but it has become one of my fave pasta dishes. 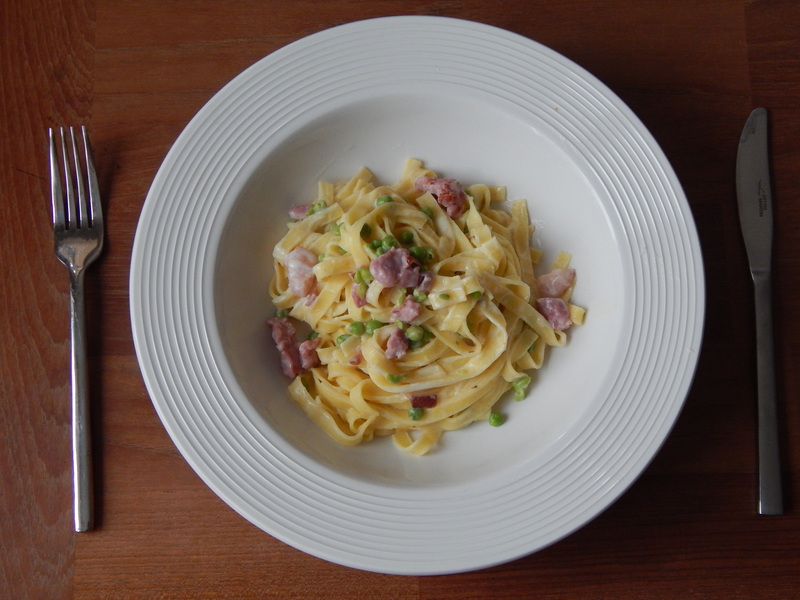 It’s quick, easy and tastes good – if I do say so myself! If I’m honest, my mum did most of the guessing and working out the different components while I just fine tuned measurements and the like. She’s a lot more adept at just throwing things in than I am. I need a super simple recipe to follow and I thought I would share it with you, just in case you’re the same as me! This will make enough for 4. Cook the peas according to the package instructions. When cooked, drain the peas and lightly mash them with a fork. You’re not trying to make mush peas but just want to make sure that they’re all broken up! Meanwhile, gently fry the onion in olive oil until it is soft. Then add the bacon and fry until it is crispy. Remove both the onion and the bacon from the pan and leave on a plate with some kitchen roll. Don’t pop your frying pan in the sink yet – you’ll need it in a minute. Add the onion, bacon, creme fraiche, lemon zest and mashed peas to your frying pan and gently cook, stirring continuously. Add the cooked pasta and stir until it is combined with the sauce. Give it a taste and if you think it needs it, you can add a pinch of salt and pepper. Serve with parmesan and chopped parsley on the top, if you’re feeling fancy. If not, any grated cheese will do! It really is that simple! As a nervous cook, I found the most stressful part of this was having different pans on the go at once. However, since it is is all getting thrown into the frying pan at the end, none of it will hurt if you do it step by step and leave something in a bowl to one side while you sort the next step out. I made quite a mess by keeping the components separate but it did make it a lot less stressful for me.